Grate the raw beetroot into a bowl and add the vinegar, mustard, sugar and dill. Season with sea salt and pepper and mix thoroughly. Set aside to let the flavours mingle. Place some beech chips in a stove-top smoker, put the lid on and warm it until there is heat and smoke in the box. Shuck the oysters and strain off any excess liquid. Place the oysters on a rack and put in the smoker on a medium heat for 5 minutes or until the oysters are warm and slightly firm. Do not overcook or allow the smoker to get too hot, as the oysters will harden. Put the crème fraîche into a bowl, add the horseradish, then season to taste and mix well. 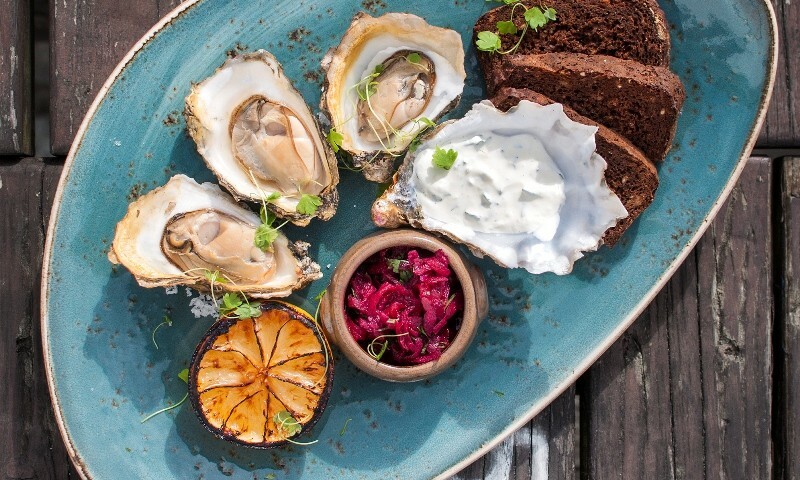 To serve, place the oysters on a serving plate, with a spoonful each of the crème fraîche mixture and pickled beetroot and a couple of slices of good bread.